Why is a catholic church named after a particular saint? A church is named after the saint whose relics (usually a small piece of bone) of the saint are placed within the altar of the church. 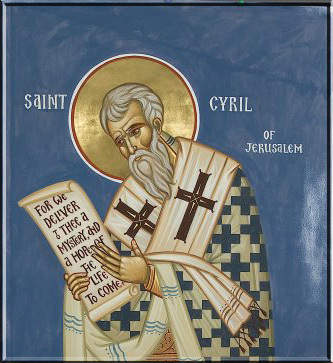 St. Cyril, Bishop and Patriarch of Jerusalem, is justly honored and esteemed by our humble church and the Catholic Church as one of the holiest and most learned defenders of the faith against the heretics, both by his sermons and writings. He was born of Catholic parents and piously brought up. In the reign of Constantine the Great (St. Cyril died the year of 386). To escape the dangerous occasions of sin, he entered a monastery, where he led a most edifying life. In later years, owing to his great reputation for learning and sanctity, he was chosen patriarch of Jerusalem. In this exalted station he displayed the zeal and courage of an apostle. He took under his special care those whose instruction in the mysteries of the faith was defective. He was vigilant in defending the Catholic doctrine and refuting the errors of the heretics. His tenderness towards the poor was that of a kind father. St. Cyril had been banished by heretics on at least two occasions with the political events of the time. When St. Cyril had returned, he saw the heretics had already raised the walls of a new church to a considerable height. When St. Cyril, came and, looking at their labors for a while, said: "Not one stone will remain on the other, for Christ has foretold it, and He cannot fail." The Jews laughed at the holy Bishop, but the sequel proved the truth of his words. The following night a destructive earthquake not only threw down the partly raised walls, but also ejected the very foundations and scattered them all over the ground. But this was not the end. As the Jews rushed together, and with grief and terror beheld the ruin of their work, a fire descended from heaven which consumed the tools and all the materials. Others say that a subterranean fire burst forth from the earth and injured many hundreds of the Jews. But a still more remarkable prodigy is recorded. On the following day small luminous crosses could be noticed on the garments of the Jews, which could not be washed away neither by water nor by any other means. Such striking wonders brought many of the unbelievers to the true faith, but others were only hardened in their infidelity. St. Cyril lived for some years after this event, and had the consolation of seeing the throne occupied by the virtuous Theodosius after the decease of the impious Constantius, Julian and Valens. Now he could govern his diocese in peace. In 386 the Lord was pleased to call to his heavenly reward this valiant defender of Catholic truth. All who knew him could not sufficiently admire the heroic patience with which he bore the many tribulations and persecutions suffered for the sake of the true faith. His writings supply the defenders of Catholic doctrine, even at the present day, with the most powerful weapons against the Calvinistic and Lutheran heresies.